The optional annex provides additional space for a queen size airbed or mattress. If needed, the annex can be easily folded down. If you often camp with your whole family, choose this large roof top tent that includes an additional annex. It's capacious enough to comfortably accommodate up to 4 people. Large windows ensure good air circulation. And the windows are screened, so they can be opened or closed without letting insects in. Internal pockets are too small. 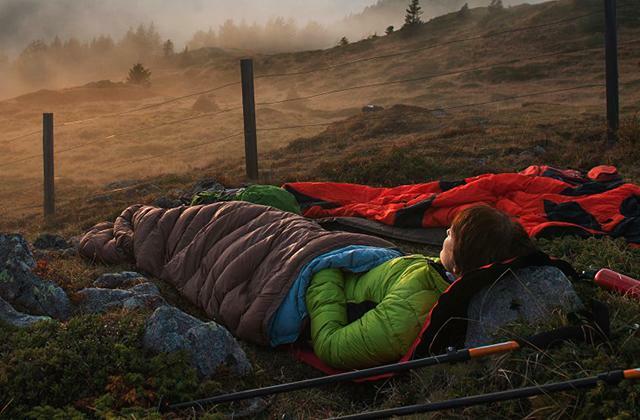 This is an ideal tent for those who prefer travel light. It's made of a special Oxford fabric and is much lighter compared to the majority of other tents on the market. There's a special 12V cigarette lighter adapter with an extension cord inside the tent. 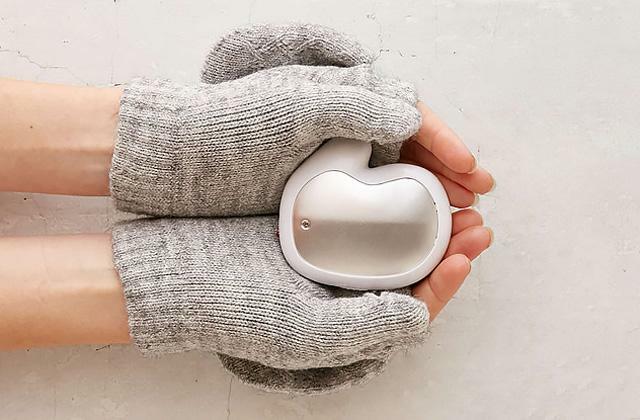 It allows you to connect your smartphone or any other gadget and charge it. The ladder is a little clunky. 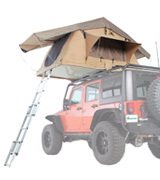 The Smittybilt Overlander tent in an affordable alternative to other big names. 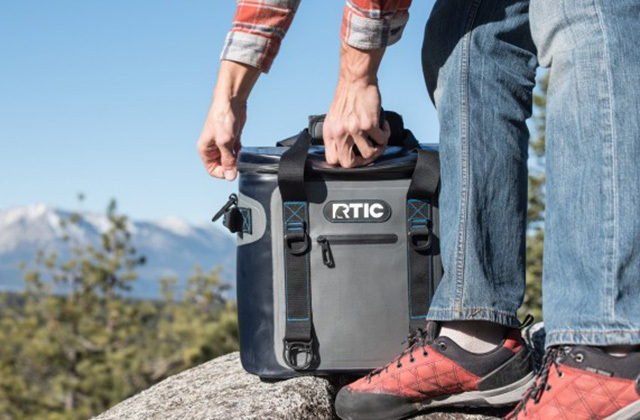 It's produced from durable materials and can withstand a total weight of up to 661 lbs. 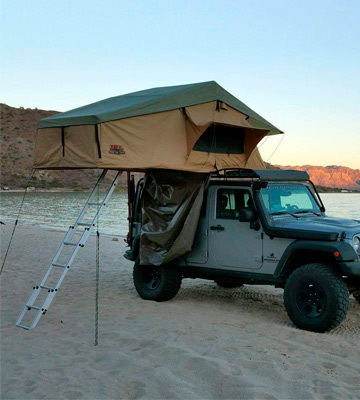 A great jeep wrangler roof top tent for occasional use. 4 large internal pockets allow you to store personal belongings and valuables inside the tent. They are made of nylon mesh, therefore they are extremely durable. The setup might be tricky at the first time. 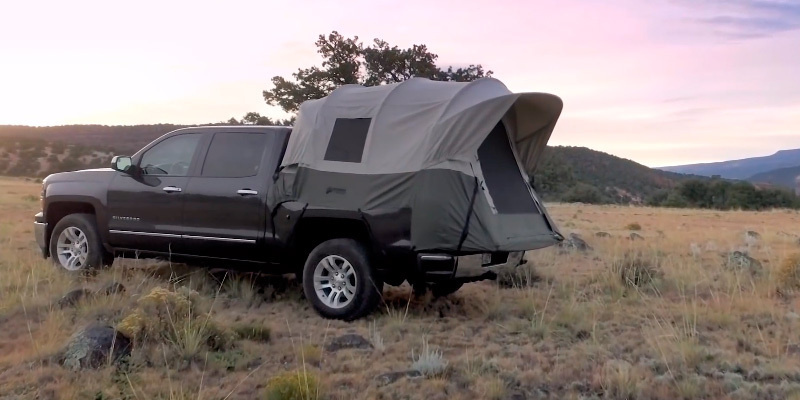 This tent is perfect for hunters who want to melt into terrain and hide their car. Its design will make you almost invisible in wild nature. 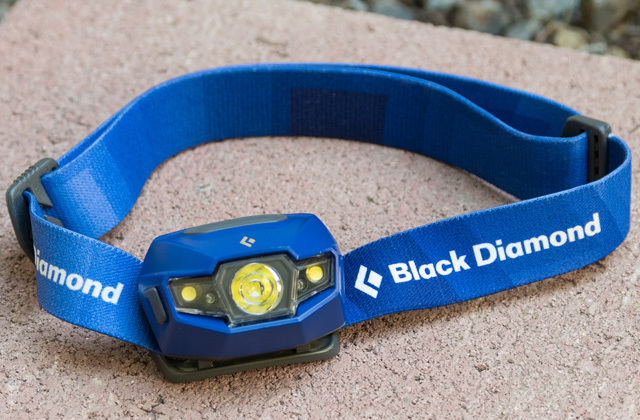 It's a heavy-duty model that is suitable for year-round use. 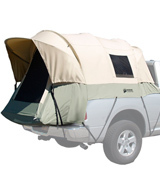 This truck top tent has a cab window that provides easy access to a car cabin. There's also a vent atop the cabin for increased airflow. Gets pretty hot in the boiling sun. 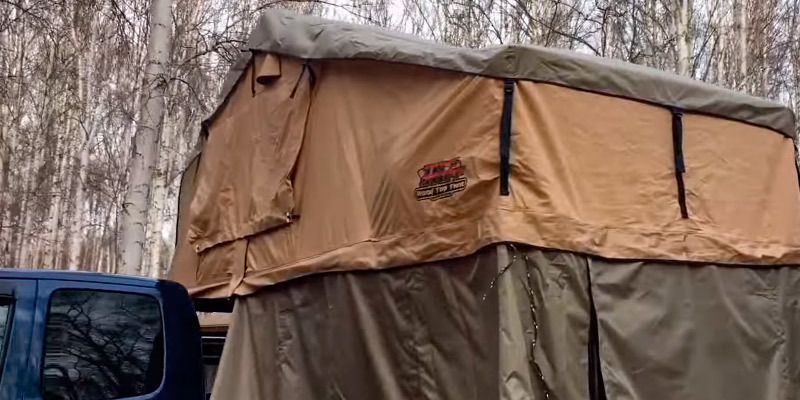 The Kodiak tent is a solution for truck owners. It can turn the truck bed of your pickup into a comfortable sleeping place for two people. Also available in other sizes to fit any truck. Looking at that ridiculously high price, probably, any camper would think twice before buying a simple top roof tent, right? Well, no, because this is not just a top roof tent. It’s a one-of-a-kind 4-person roof tent that includes an annex room. The annex is a fantastic addition, especially if you’re traveling with your friends or pets. It’s fairly big and even has a floor made of very thick and flexible material, just like the transport cover. Overall, the construction of this car roof tent is great. The floor and all the poles are aluminum, while the hinges and brackets which take the most stress are produced from durable stainless steel. 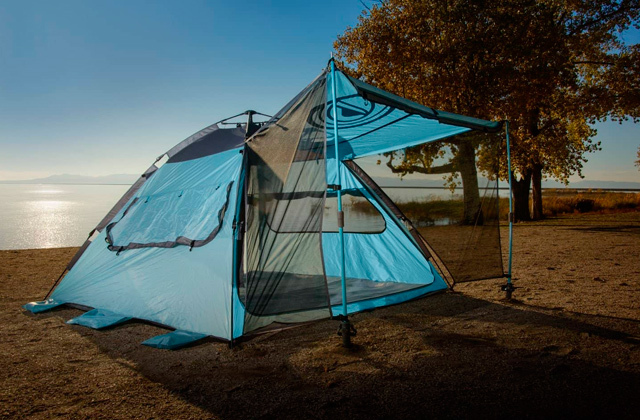 The tent itself is made of poly-cotton ripstop fabric with a waterproof coating that’s also UV- and mold-resistant. The zippers and the stitching appear sturdy and well-constructed. Yet, the tent can get a little hot in the boiling sun. However, 2 windows and 2 doors can make things better. They can be completely opened or rolled up to mitigate the heat. 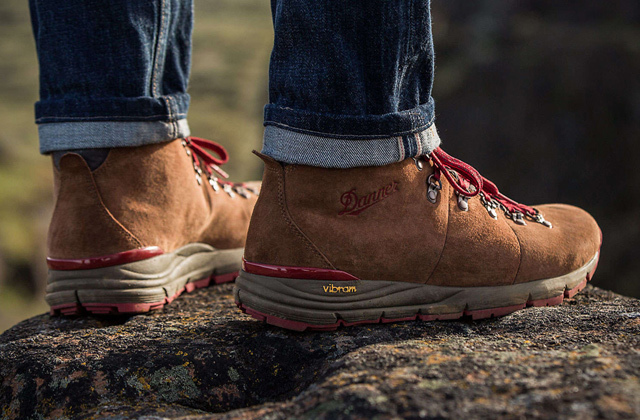 Their zippers are smooth and chunky enough to take all the abuse of camping. The thick high-density sleeping mattress is already pre-installed inside the top tent. Plus, the annex can also accommodate a queen-sized mattress if needed (not included). And if you think that so many add-ons make the setup tiresome, you may rest assured that in 10-15 minutes after parking, you will be relaxing inside the tent. The Feather-Lite car top tent by Front Runner is another high-quality model that has a lot to offer. It’s called so not without a reason. The thing is that it's manufactured from a special poly cotton Oxford fabric (400D) and is much lighter compared to the majority of other tents on the market. And that’s the main reason why many customers prefer this very camping tent to others. Agree that carrying a 120+ lbs tent by yourself might be rather tricky. And this 88-lb model is a real game changer. But not only its light weight makes it so appealing to campers. The tent holds up well different weather conditions. Storm with strong wind won’t be an issue for this sturdy temporary house. The insulated aluminum base is extremely solid, however, it might get cold in chilly nights. The tent has a lot of zip-up windows which are screened, so they can be opened without letting insects in. Also, there’s a top vent to circulate more fresh air. The tent is supplied with a large mattress, and all you need to do is get pillows and blankets. The mattress is 2-inch thick and pretty comfortable to lay on throughout the whole day. Out of the box, the tent might be a bit difficult to set up, especially if you do this alone. Other than that, it’s an excellent tent for those who like to travel light. 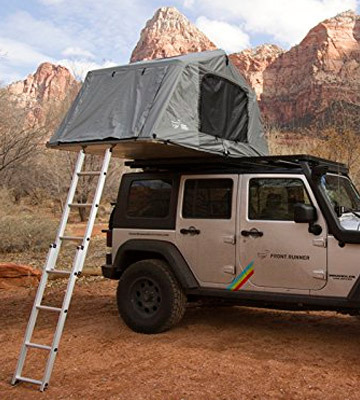 If you’re on a budget and aren’t willing to pay $1000+ for a roof tent, the Smittybilt Overlander Tent is a solution. Its fabric is surprisingly robust and thick for the price. And although the car top tent comes with a waterproof rainfly, it’s also treated and will do well in a light rain by itself. And once you remove the rainfly, you can let more air in or watch the stars through “sunroof” openings the tent has on the top. Inside, there’s a 2-inch mattress which is fairly comfy yet not very dense - you can feel the base of the tent if laying for too long. This tent is wide enough for two people to sleep, and in case you always travel with your kids and need more space, the manufacturer offers the same tent in a larger size, which can accommodate 3-4 people. 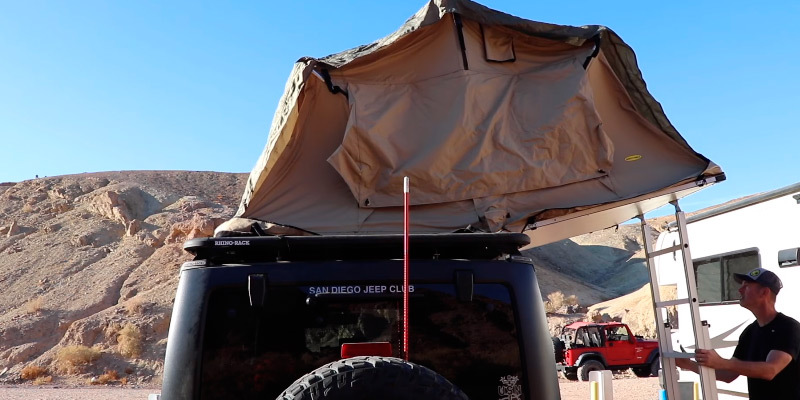 But if you travel with your friends or relatives from time to time, you can optionally get the additional Smittybilt annex with a removable floor that can be easily attached to the bottom of the tent with heavy-duty zippers. The annex can provide not only additional sleeping places but also extra space for cooking. The tent, as well as the annex, is simple to set up. 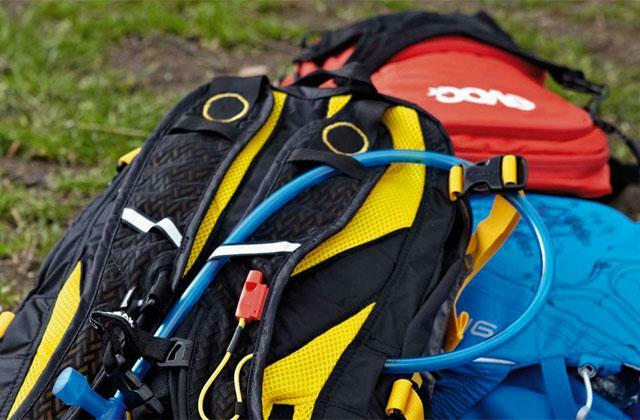 You just need to remove the cover, undo the loop straps that hold the tent together, then loosen the double D-strap (secures the ladder), pull the ladder out, and pop the tent up. The ladder is pretty stable on the ground, however, you might experience a few problems with straps. Their material and the stitching are on a weak side. Still, we believe that its price overcomes all slight drawbacks. 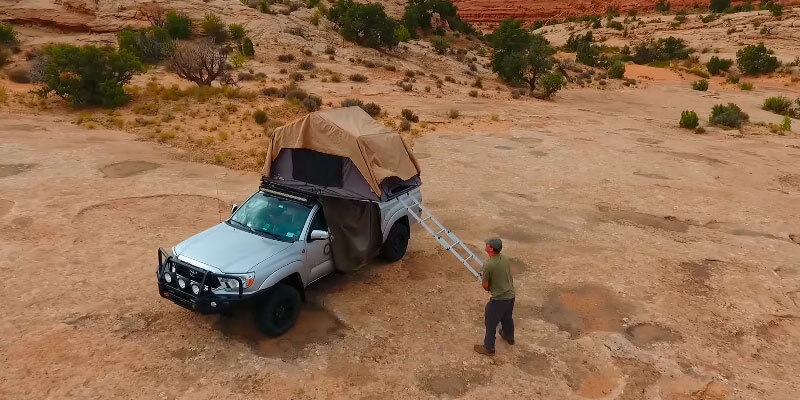 If you’re a penny pincher who intends to use a tent a handful of days a year, the Smittybilt Overlander is a go-to option. 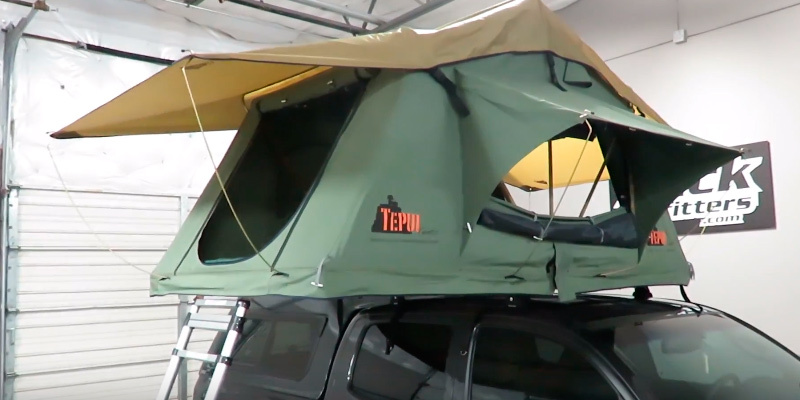 The Tepui Kukenam Sky Tent is not only durable but also very attractive. It’s available in four colors (Camo, Haze Grey, Olive Green, Siberian Camo) to suit your vehicle and taste best. And some of these designs allow you to meld into the wildlife. The tent is made of the 600D poly cotton ripstop material that is water-resistant to some degree. Though, the manufacturer has thoughtfully included a rainfly treated with DWR to keep the tent absolutely dry in heavy rain or snow and free from UV-rays in the direct sun. This way, this model is great for year-round use. 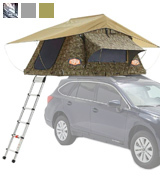 The entry into this tent is very convenient as the ladder features wide rungs and is very stable. The entry has the “fabric weather flap” that gives a barrier for flying pests to get through. 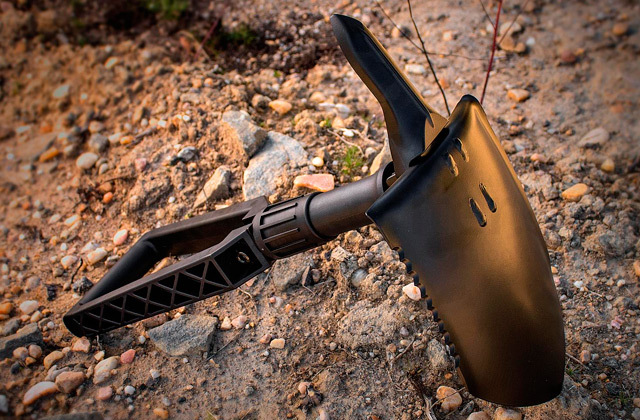 The tend does have two grab-handle straps that make getting in/out very easy. Mounting the tent to a car rack isn’t a challenge at all, as the manufacturer provides thorough instructions in the box. 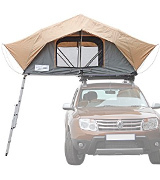 The tent comes with universal mounting brackets which are suitable for most roof racks and after-market roof bars. The tent is wide and capacious inside. It offers plenty of room for two adults and a child to sleep restfully. It’s fairly long and is suitable for tall individuals. There are some usable pockets for storage different stuff inside. So, if you need a highly-functional and versatile tent for all-year use, this premium model from Tepui is a sensible option. 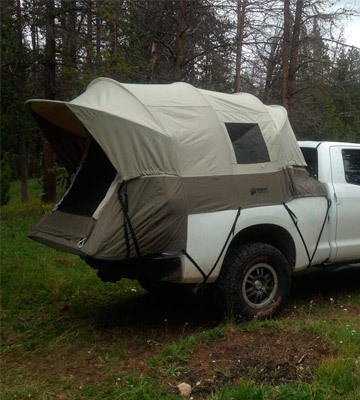 If you're an owner of a large pickup truck, this tent is just what you need! It's a solid canvas tent that can convert the trunk of your vehicle into a comfy place to sleep and rest. It's a decent product that comes at the terrific price. Made of Hydra-shield 100% duck canvas with the silicone finish, it's quite durable and watertight. The canvas is very thick, and you won't experience problems with stitching. It's built to withstand strong wind and even snow loads. Unlike nylon tents, this model features large heavy-duty zippers that glide smoothly. 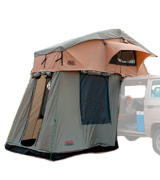 The tent has a lot of windows and even a vent over the cab and the cab access window, however, some users note that neither bugs nor fresh air get through the screens. Though, you can always put a USB-powered fan near any side window for better air circulation. The tent sets up over the tailgate down, providing some additional space for your shoes and other stuff. It can be completely installed in 10-20 minutes. Once you're done, you'll get a tunnel-shaped camp tent that's 5-foot tall. And you'll get the width of entire bed from the cab to tailgate. It has a handy lamp hook in the center of the ceiling and side mesh pockets for stoving small items. In all, it's a great choice for pickup owners who don't mind little ventilation. The tent is very strong and simple to install. 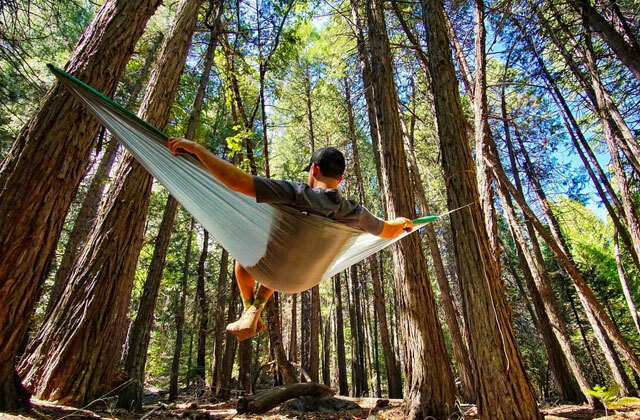 Just set it up and you're ready to camp. 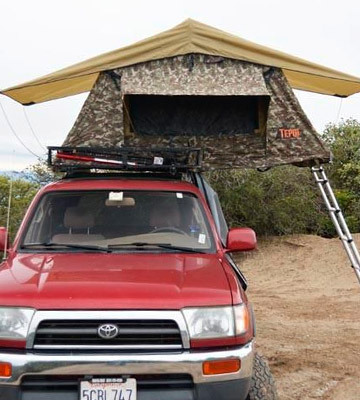 What Is a Roof Top Tent? 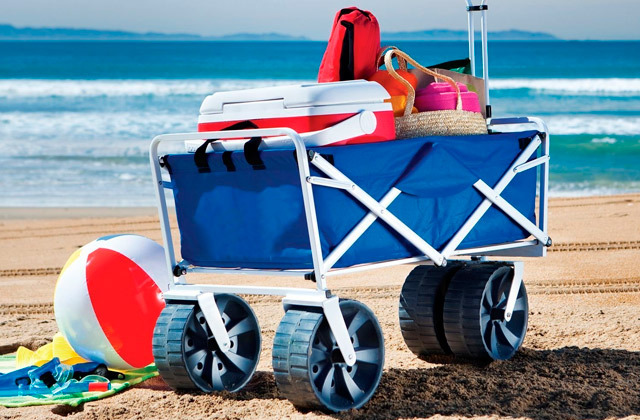 Is there a better alternative to renting a trailer and setting off for an adventurous trip? Yes! 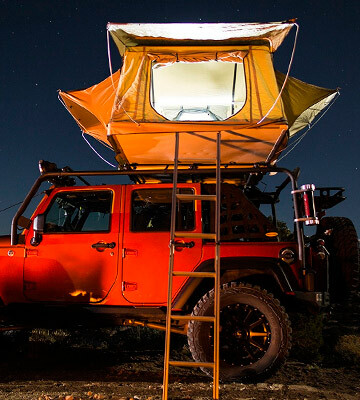 A roof top tent is a way out. It's a compact and relatively light temporary home that can be easily installed right on the top rack of your vehicle via a locking latch system, thus you won’t need to screw in any bolts for installation. Typically, most models come already with a thick mattress to provide you with a comfortable sleeping area. Moreover, some tents come with optional annexes that offer a bit more space for large families. 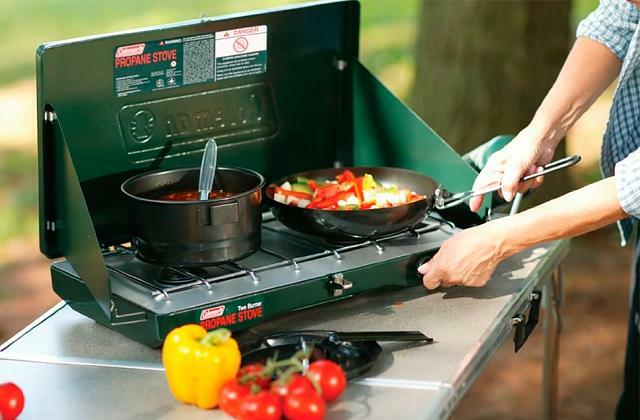 An annex can also double as a small kitchen at your campsite. It's up to you to decide on how to use it. In this review, you can also find models that are suitable for mounting on a truck bed. No matter what tent you choose, you can be sure that it will offer you a great opportunity to be up in the air, out of the reach of animals and humans. By the way, all tents in our review are made of high-quality materials that are resistant to rain, snow, and UV-rays. So, the bad weather will never catch you completely unawares. 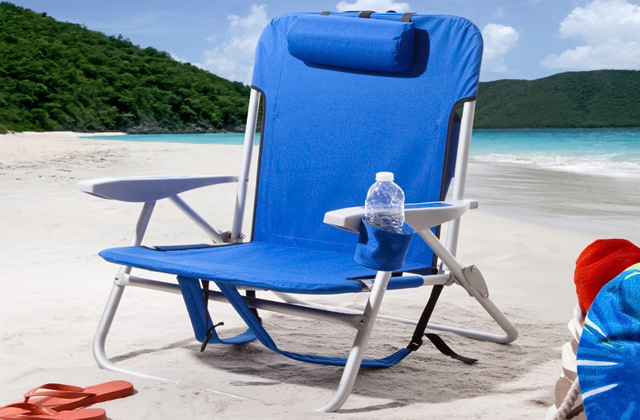 Camping stoves and chairs are other useful gear that will come in handy during any adventurous outdoor trip.